As far as I understand the popular science explanation of black hole evaporation, quantum fluctuations of vacuum at the event horizon create a pair of matter-antimatter particles. One escapes thus reducing the mass of the black hole. So far so good. However, just outside the horizon, the same effect must be continually feeding new particles into the black hole. The outside sphere is somewhat bigger, there must be more mass entering than leaving. I suspect he popular explanation must be leaving out some important details? One thing to keep in mind is that the formation of virtual particles just outside the event horizon comes from "borrowed" energy. Under normal circumstances, these particles only exist briefly, before rejoining and returning this borrowed energy. It is a quirk of QM that allow this to happen without violating energy conservation. If, however, one of the particles crosses inside the event horizon before the rejoining can occur ( it does not matter whether it is the particle or anti-particle), You are left with a lone particle. The energy books must be balanced in order for this particle to continue to exist, and this come from the mass of the BH. One of the virtual particle pair has become a real particle at the expense of the BH. This particle may escape, or more likely interact with another particle which produces light radiation that does escape the region near the event horizon. You end up with some "leakage" of radiation. That being said, only black holes below a certain size would end up experiencing net shrinkage through Hawking radiation. One of the features of Hawking radiation is that it increases as the mass of the Black hole decreases. Large black holes lose mass through Hawking radiation at a much lesser rate than they gain it from other sources. Any stellar sized black hole, even if far away from any matter that it could absorb would still be gaining mass from just the cosmic background radiation faster than it lost it through Hawking radiation. For a black hole to lose mass faster than it gains it from the CMBR, it could not be any more massive than our Moon. This is much smaller than any black holes that form today, but there is some speculation that small or "quantum" black holes could have formed during the early universe. It is possible that some of them survived to our time. Even present day large black holes are subject to eventual evaporation. As the universe continues to expand, it cools which decreases the intensity of the background radiation. At some point it will cool enough for stellar mass black holes to begin to evaporate as they lose mass faster than they gain it even through the CMBR. But we are talking about really, really, really long time scales. Physiology & Medicine / Re: Why do optometrists dilate our eyes then do the exam? By dilating your eyes and reducing your depth of field, they are making your eyes more sensitive in small changes in the prescription. In other words, when they ask you if "1" or "2" looks better, You'll see a larger difference with your eyes dilated than with them not, which allows them to fine tune the prescription more accurately. I think your example is missing a step, overcoming inertia. A spinning space craft must constantly overcome inertia, which is especialy important with liquid. When a drop of water hits a water surface another drop of water is released from the spash. On Earth gravity will bring the drop down, but in the space craft lake the drop will continue upward for several minutes. The wayword drop will continue until it hits something or dissipates. But that drop of water will have the same tangential momentum it had when it it was part of the body of water. Thus it will travel in a straight line along a vector determined by its initial inwards velocity and its tangential velocity. Since the surface of the space ship is curved inwards as is the surface of the water, this path will intersect the water again. For anyone moving along with the rotating craft, will also have a tangential speed that stays pretty much equal to that of the drop of water. So from their perspective, the water rises from the water and then falls back down. There will be a small apparent drift due to Coriolis effect, the larger the "inward" velocity of the drop, the more apparent this will be. But unless you completely remove all of the tangential motion of the drop ( effective throwing "backward" against the rotation at exactly the rotation speed), it will not fail to return to the water surface. Thank you for answering. This is a good description of it works in movies, but I don't believe this is correct. While gravity has an area of effect, a spinning space craft can only effect what it touches. Without gravity a thrown baseball will continue it's trajectory until it is acted on by an outside force, even if that force is air. Throw that ball in the exact opposite of the rotation and it might stay in one spot. I don't know what the answer to this question is, which is why I'm asking. If you threw the ball at exactly the right speed, then yes, you could make it standstill relative to the station axis and not "fall to the ground. However the station would be still turning, Thus for you the person throwing the ball, it would appear that the ball was traveling in a circle at a constant distance from the floor. ( ignoring any air resistance). But you can't ignore air resistance. If add air to the station, that air will expand to fill the station, when it does so, it comes in contact with the rotating walls air molecules striking the wall will be be given some of the wall's these molecules will go on to transfer it to other molecules, etc. Eventually, you will end up with the air in the station having the same angular velocity as the walls, and rotate with it. If you throw your ball now, it will have to deal with the drag caused by this air which worls to drag the ball around it with the station. The ball will not be able to maintain is fixed position and will drift, until it hits the "floor" picking up more motion from it. The same happens for water, it would be eventually dragged to have the same velocity as the floor. So while there might be a bit of "settling down" to do at first, eventually you'll end up with water hugging the floor and air pressing against it. *This only works if you throw the ball at precisely the right speed. Any slower or faster and it will drift in a straight line until is hits the curved floor of the station. Physics, Astronomy & Cosmology / Re: Do you think Tau Ceti e is inhabited? Call it 99%. 99% of 150° is 148.5°. Sorry to be the pedant, but are you scaling a temperature? In ° F?!? At the very least, please use an absolute temperature scale (Kelvin or Rankine) before multiplying temperatures by any factor, otherwise we end up with such silly results, like: "50% hotter than 32 °F (0 °C) is 48 °F (8.9 °C), but 50% hotter than 0 °C is, still 0 °C?" or even worse: "50 % hotter than 20 °F (–6 °C) is 30 °F (–1.1 °C)..."
Even with absolute temperatures, scaling is somewhat nonsensical, but at least the maths work out. Yeah your right. Silly mistake on my part. Using the same numbers gives ~ 144° F. For difference of 6°F. But then again, I was being generous with the 99% estimate. At the highest resolution of the graph in the paper, you might get 99% of circular orbit equilibrium temp at an eccentricity of 0.4, better than twice the eccentricity of Tau Ceti e, and its on a curve that flattens out as you approach 0 eccentricity. Physics, Astronomy & Cosmology / Re: What is the origin of Earth's magnetic field? It is a mystery why Earth has a magnetic field, and Mars doesn't (any more). Mars is slightly smaller than Earth, so it would have cooled slightly quicker - but not much quicker. Perhaps the collision that produced the Moon might have injected a pulse of energy into the Earth's interior, keeping it hotter for longer? The iron core of the impactor would have sunk towards the center of the earth, merging with Earth's core. Physics, Astronomy & Cosmology / Re: How long could a 400kg space probe last in an antimatter plasma? Plant Sciences, Zoology & Evolution / Re: Why so many flowers have 5-fold simmetry? This has to do with the most efficient way for the flower to grow out from the center. In many cases the center of the flower consists of seed that grow outward from the center. 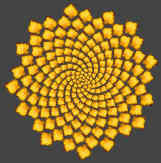 The way to make the best use of the space is to grow in a pattern called a Fibonacci spiral, like this. This results in the out-most layer consisting of a number on the Fibonacci series, and this is were the petals originate. It is a geometry issue, but one sealing with how to maximize use of space, and not molecular bonds. General Science / Re: Do we pee more than we drink? When your body burns food for energy, one of the by-products is water. So even if you actual fluid intake is low, you can end up with a fair amount of water in your body that you need to get rid off. If it wasn't for the fact that we get rid most of this through exhaled moisture in your breath, you'd be be peeing a lot more than you are now. Physics, Astronomy & Cosmology / Re: Would particles orbit a falling body? Physics, Astronomy & Cosmology / Re: Can gravity be said to act in two opposite directions at once ? Here's a map (not to scale), marking the lines of gravitational potential for the Sun-Earth system. And here's another showing a cross section of the gravity wells of the planets of the solar system within the gravity well of the Sun. Physics, Astronomy & Cosmology / Re: Is acceleration downwards due to gravity less when the Moon is overhead? Physics, Astronomy & Cosmology / Re: How does dark matter affect galaxy rotation? First off, the "halo" is not a ring. It is a spherical volume in which the galaxy is embedded. A ring shape is not what the word "halo" means in astronomy. Also, within such a spherical volume, at any given point The only gravitational effect would be caused by that material closer to the center than that point (Newton's shell theorem). The visible matter of the galaxy is mainly confined to the bulge and disk. Once you get away from the bulge and into the disk region, moving further out does not add much to the contribution that the visible matter contributes to to your orbital speed. The dark matter, however extends well above and below the visible matter disk and the thus the amount of DM closer to the center of the galaxy grows quite fast. For example, the density of DM in the vicinity of the Solar system is so low that it would only adds up to the equivalent of a small asteroid within the entire volume of the Solar system. At that same density, the spherical volume of the region closer to the center of the galaxy than the solar system would hold a significant fraction of the entire visible galaxy's mass. Physics, Astronomy & Cosmology / Re: What spun-down the inner planets ? R the radius of the body. Q and K are not well known except in the case of the Earth and Moon system. So for the sake of argument, we will assume they are the same for all three planets and the Sun. Since we are comparing planets orbiting the Sun G and M will be the same. Earth is 2.58 times further from the Sun than Mercury, so it would take nearly 300 times longer to tidal lock to the Sun. The Earth is 1.38 times further than Venus and would take 7 time longer to lock. Assuming all other things are equal. One thing to keep in mind is that tidal forces fall of by the cube of the distance. So even though the Moon's tidal effect of the Earth is ~ twice that of the Sun's, At the distance of Mercury, the Sun's tidal force has increased by a factor of 17, and be 8.5 times stronger than the Moon's effect on the Earth and at the distance of Venus it would be 1.3 times stronger than the Moon on the Earth. But we don't know that all things started out equal or stayed that way. For example, the Earth is believed to have been struck by a Mars sized body in its past which initially formed the Moon, and likely spun the Earth up quite a bit. This would have given it a lot more rotational energy to shed. Venus actually rotates slower than it orbits. This also may have been due to a collision; one that robbed it of spin rather than giving it more spin. So without knowing the full history of each planet it is hard to say what all the influences were that contributed to their present rotations. Physics, Astronomy & Cosmology / Re: How fast does the atmosphere rotate? I am not quoting that long long post Janus ! That is in no way analogous to how ocean waters redistribute themselves to form the tidal bulges. In forming the bulge, water just below it rises, the water below that takes its place, the water next to that water does the same, etc. By the time it gets to the end of the take, the water there just moves in a little to fill the space left by water that vacated that space. The water missing at the ends does not flow all the way to make up the water in the bulge. That's like saying that when the row of railway cars shown in the next image moves one car length to the left, it is because the rightmost car passed through all the other cars to become the rightmost car. Physics, Astronomy & Cosmology / Re: What is Important About Instantaneous Age Changes in the Twin "paradox"? My reasoning may be wide of the mark, here, so I would value comments. Acceleration involves a change in speed, direction or both, thus, the “turn-around” constitutes acceleration. The “twins paradox” comes about as a result of time dilation and length contraction. The Lorentz equations, which gave mathematical veracity to time dilation and length contraction, feature only time, length, velocity and the speed of light. There is no mention of acceleration. Einstein incorporated time dilation and length contraction into SR, and SR is concerned only with uniform motion. There seems to be no need to venture into general relativity. So why do we have to use acceleration to solve this particular paradox? You are forgetting the relativity of simultaneity. While time dilation and length contraction are only dependent on the speed difference between two frames, the relativity of simultaneity is dependent on the velocity difference, which involves direction. If you are traveling from A to C, then clock C will be, according to you, ahead of clock A in respect to what time it reads and if you are traveling from clock C to A then according to you, clock A will be ahead of clock B. You're traveling at 0.6c relative to the three clocks, for which the proper distance between the clocks is 1 light hour. Acceleration comes into play with time dilation and length contraction when it involves a change speed, as changing speed changes the magnitude of these two effects. Acceleration additionally effects the relativity of simultaneity when it involves a change of direction. *Keep in mind that this is the time it "is" at these clocks and not the time you would "visually see" on these clocks. In all these examples, when you are next to clock B when it reads 12:00, both you and an observer sitting by clock B would be visually seeing images of Both Clocks A and C reading 11:00. Must have logic , live by it ! Speaking of planetary systems , how do you like that Earth-Moon system ? 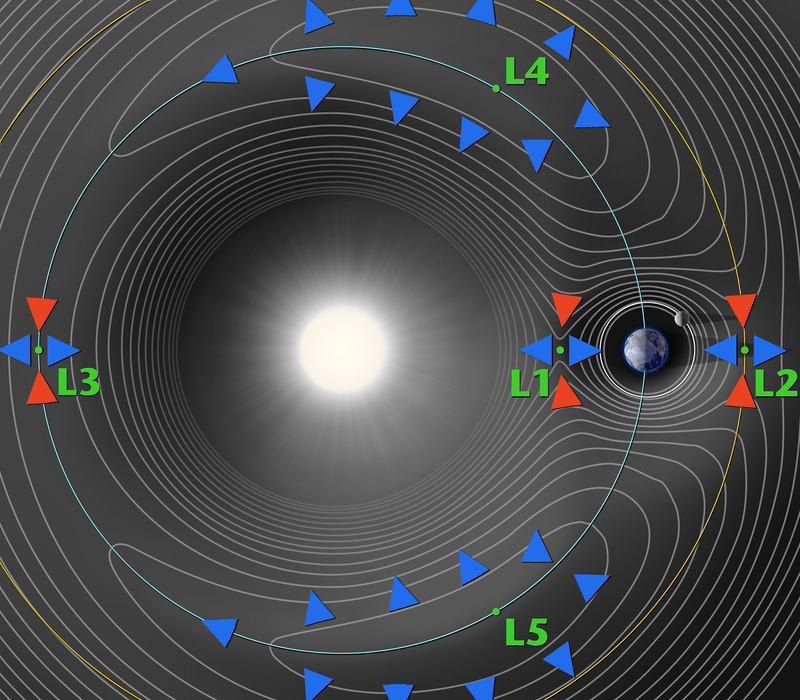 Much of Earth's initial angular momentum has been transferred to Luna , BUT much of it was converted to heat in the process . Were it a perfect transfer , the E.-M. system would be in a different location , with a different momentum . If you now spun the Earth in the opposite direction , the opposite effect would occur . Bottom line , destroying energy of momentum works as well as removing mass. Sounds like a propellantless rocket to me ! Hokay , next victim ! P.M.
P.S.-" l'm freakin' Bobby Fisher ! " As already noted the Earth Moon barycenter doesn't shift due to the tidal acceleration of the Moon. If we were to accurately account for all the factors we would get agreement in the numbers to whatever level of accuracy we had for those factors. Now the Earth does heat up in this exchange, so some part of its remaining angular momentum will be due to the "effective" mass increase due to that thermal energy, And the Earth will radiate that energy. But this does not mean that there is any net change in total angular momentum. Because, as I already mentioned earlier Electromagnetic radiation exhibits the property of momentum and this "lost" angular momentum is being carried off by this radiation. Thus, if you take the Moon, Earth and the radiation emitted by the system all into account, there is no net gain or loss of momentum, angular or otherwise. There is nothing "reaction-less" about this at all. Physics, Astronomy & Cosmology / Re: Would an asteroid hitting the moon have any impact here on Earth? I estimate that there is an equal balance point between Earth and Moon (Lagrangian Point L1) that is about 43,000km from the Moon, so something flung off the Moon in this direction would only need to start with about 1.9km/s velocity, which is less than Lunar escape velocity. But that is also a very specific trajectory. L1, some 326054 km from the Earth, is a point where, with the help of the Moon's gravity, an object could be placed and it would stay (if not further disturbed) even though it is traveling at a speed slower than what would normally be needed to maintain a circular orbit. Reaching L1 does not mean you now have a free trip to Earth. If we were to remove the Moon, an object at L1 distance from the Earth and moving at L1 point velocity would be at the apogee of an elliptical orbit with a perigee of ~143250 km from the Earth. (orbital energy/kg = v^2/2-u/r = u/2a, where a is the semi-major axis of the orbit. Even without the Moon's aide, an object placed at the L1 point would not "fall" all the way to the Earth. To get such an object to reach Earth surface you would have to reduce its L1 point velocity to ~217 m/s or by an additional 647 m/s. V_r = sqrt(u(2/r-1/a) where a= (r+r_e)/2 and r__e is the radius of the Earth. Again, this velocity change would need to be applied in the opposite direction of the orbital velocity. From the actual L1 point, its going to take a bit more. That same gravitational "help" the Moon gives an L1 point object in allowing it to hold position, is now going to be a hindrance in trying to reach Earth. Think of it this way, without the Moon, the object would drop to 143250 km from the Earth, with the Moon, it maintains a constant 326054 km distance. That means with the Moon, you would have to give the L1 object a push in order to force it into that elliptical orbit that it would naturally assume without the Moon. The same is true for putting it on an Earth intersecting trajectory, its going to take more effort to put it on that path with the Moon than it would have without the Moon for the Same object starting at the same point and speed. This is orbital mechanics that we are dealing with. Intuition often leads you astray. New Theories / Re: What is the applied hour in the theory of tides? With the blue inner circle the Earth and striped oval the oceans, and the Moon dragging the ocean around with it. Physics, Astronomy & Cosmology / Re: How fast would the earth spin if the moon was closer? I do ot see why moving the moon closer would cause it to spin any faster, other than as a byproduct of the increaced orbital velocity around the mutual centre of gravity between the moon and earth . If the rotation of earth is merely a balanced motion that is dependant on the observer, ie measured from the sun. If you move the earth and moon closer however they would biorbit each other at an increased formulaic velocity. Could you explain why the spin would have to have a defacto increace?